Barefoot Resort is a golfer’s paradise. Golf icons Greg Norman, Tom Fazio, Pete Dye and Davis Love III designed the 4 golf courses around which this extraordinary community is built. But remarkable golfing is only one of the many benefits of living at Barefoot Resort. The lavish rambling community on the Intracoastal Waterway offers more than just golf. Tennis courts, basketball courts, volleyball courts, fitness centers, spas, picturesque trails, owners clubs, community pools and salt water pool, barbeque areas and marina are just some of the amenities that make Barefoot Resort a paradise on the Grand Strand, away from the noise and traffic of the everyday world. You will find the home of your dreams with more than 15 Barefoot communities and housing options to fit any budget or need. Whether you are looking for a single-family home, a townhouse, or a condominium, Barefoot Resort has the home for you. If you are looking for an investment, a place to retire, a vacation home or a year round home, Barefoot Resort offers the best North Myrtle Beach has to offer. Bridle Ridge is a great place to raise a family with 2-3 bedroom homes and a variety of floor plans for a casual or formal lifestyle. Leather Leaf is perfect for those who like a little variety in their life. The upscale 3-4-5 bedroom homes vary from a cozy 2,100 square feet to a spacious 4,000 square feet with formal dining rooms and landscaped yards. Oak Pointe is a private, gated neighborhood. Homes offer open, stylish floor plans and 12 foot ceilings. Sweetbriar is one of the newer neighborhoods and features some of the resort’s most affordable single family homes from 1,200 square feet to 2,400 square feet. Dye Estates is one of the most upscale neighborhoods. Dye Estates features a guarded, gated lavish community built around the Pete Dye Golf Course. 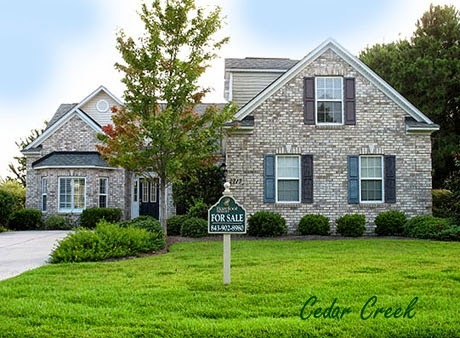 Cedar Creek is another upscale neighborhood near the Love Golf Course featuring roomy 3-4 bedroom homes. Longbridge features affordable one-story 3-4 bedroom homes with landscaped lawns. Somerset is a small, pleasant neighborhood with 3-4 bedroom homes that make an impeccable first home or a lovely place to retire. Brookstone is one of the newest neighborhoods. Designed to be in harmony with the nature preserve next to it, Brookstone is the perfect neighborhood to raise a family or retire. Tuscan Sands is the newest community in Barefoot Resort. Next to the Greg Norman Golf Course and the Intracoastal Waterway, it is a golfer’s dream. Purchase of a home in Tuscan Sands includes membership to the Dye Club and preferred access to all 4 golf courses. Call or contact us today and let us show you the beautiful life and beautiful homes that wait for you at Barefoot Resort.